Perhaps one of the most confusing things about the profession of music therapy to many people is why it even exists. People have been playing music for centuries to manage various problems, right? Why would you need special training for that? Why can’t I just use music on my own to feel better? That’s a fair question, in my opinion. It is certainly true that people often find musical experiences they need, whether that is listening to Metallica when they’re angry, singing in a church choir for a richer spiritual life, writing songs to get over a break-up, or turning on some Rossini to wake up in the morning. These are valuable skills, and you don’t need a music therapist to put them into practice. We even have a lot of research now showing ways that people use music to improve their well-being, even without a music therapist involved. These studies tell us things we already know from experience – people (especially healthy people) can find ways to use music to improve their lives. Sometimes, though, it seems that the person of the music therapist can make the crucial difference in the music experience. A 2011 study* published in the Journal of Music Therapy looked at a music program designed to be implemented by caregivers with their family members who have dementia. A music therapist met with each caregiver and care recipient to put together an individualized CD and to practice various methods to use with this music, such as listening to a musical selection and discussing the memories elicited, engaging in gentle movement to music, drawing images with the music, practicing progressive muscle relaxation, or playing instruments along with the music. The caregiver and care recipient were then asked to listen to the CD at least three times per week while doing at least one of the music methods suggested. The purpose of this music program was to reduce stress and enhance caregiver satisfaction, and it seemed to work: both caregivers and care recipients reported improved relaxation, comfort, and happiness compared to measurements before implementing the music program. This is great news, because it indicates that regular people – caregivers and care recipients – can implement this kind of program on their own with a little bit of training and receive some great benefits. “Comments from caregivers who dropped out of the research demonstrate the need for support while caring for a loved one with dementia. Again, in order to maximize the effectiveness of this protocol, the presence of a qualified music therapist could have helped the caregiver manage some of the behavioral symptoms that characterize dementia” (p.21, emphasis mine). They then suggested that regular phone calls from the music therapist or occasional visits could make enough of a difference for the caregivers to keep going with the music program. Then, the benefits of experiencing music in this way would follow. I do hope that you are finding ways to share music experiences with your loved ones, especially if you are caring for a family member with dementia. I am working hard to provide resources for you, right here on this website. If you haven’t already, please check out the song spotlights section for a lot of great songs to encourage discussion and reminiscence, and the caregiver section of the blog for lots of articles on using music in caregiving situations. If you want to know more about a particular topic, please let me know! You can leave a comment below or contact me privately, and I’ll work on getting articles up that you can use. Experiencing music together can have great benefits for you and your care receiver. Have fun as you spend more time having music together, and please, contact me if you need some support! * Hanser, S. B., Butterfield-Whitcomb, J., Kawata, M., & Collins, B. E. (2011). 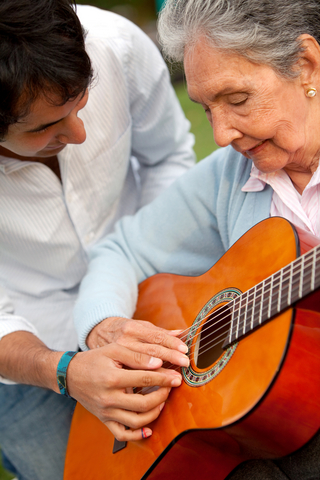 Home-based music strategies for individuals who have dementia and their family caregivers. Journal of Music Therapy, 48, 2-27.